A day after it was flagged off by Prime Minister Narendra Modi, India's first semi-high speed train, Vande Bharat Express, ran into some trouble twice on Saturday while returning to Delhi from Varanasi, officials said. The first incident occurred around 15 kilometres from Tundla junction in Uttar Pradesh, with officials calling it a case of "skidding wheels". "This disruption appears to be because of a possible cattle run over. The train was returning at night and cattle run over is a possibility at odd times," Railway spokesperson Smita Vats Sharma said, adding this was not a commercial run, which is scheduled to start from Sunday. According to sources, including several journalists on board the train, it was stuck near Tundla for over an hour. "It was a case of skidding wheels after the train ran over cattle," Northern Railway CPRO Deepak Kumar said. After removing the obstacles, the train resumed its journey to Delhi at around 8:15 am, officials said. However, it suffered a breakdown after 40 minutes at Hathras Junction and could resume journey after 10:20 am and is now running at a speed of less than 50 kmph, sources said. 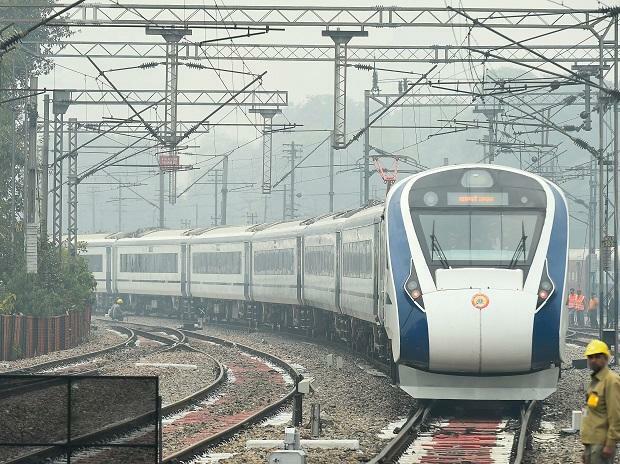 Vande Bharat Express had hit 180 kmph during a trial run on a section of the Delhi-Mumbai Rajdhani route, thus becoming India's fastest train. The train had left Varanasi Junction at 10.30 pm for Delhi on Friday, nearly 45 minutes after reaching the holy city on its inaugural journey. Train 18, which was rechristened Vande Bharat Express by Railway Minister Piyush Goyal, has been manufactured by the Integral Coach Factory, Chennai.